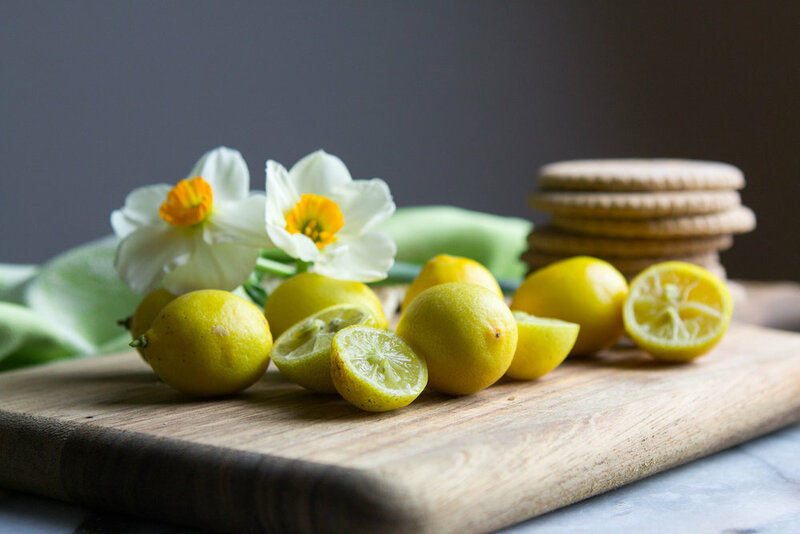 Upside Down Lime(quat) Bars — knead. bake. cook. It generally starts with an ingredient that I am trying to use up. I have talked about this often on this blog. It is rare that I will start a recipe with completely new ingredients. Rather, my process starts with an ingredient that I already have. This time, it was limequats. Like mandarinquats, limequats are a kumquat hybrid. And also, like kumquats, they are pucker-your-mouth sour. As we approach the end of citrus season, my citrus pile is waning. What was once a huge bowl filled with Cara Cara oranges, blood oranges, navel oranges, grapefruits, limes and 'quats (all at various points in time during the winter), is now a sad blood orange and a cocktail grapefruit. Sadly, these limequats I received from a friend a few weeks ago were also nearing the end of their days. Since I wasn't likely to eat all of them in one sitting, I decided that I would try to make a lemon square/key lime pie hybrid. The idea I envisioned was that these bars would have the crust of key lime pie and the filling of lemon squares. What's not to love, right? The crust was straightforward—Diamond Bakery Royal Cream Crackers (which are similiar-ish to graham crackers), butter, sugar and salt. I pre-baked this for about 20 minutes and moved onto the filling. I didn't have exactly enough limequats to reach ½ cup so I also used regular limes as well. Luckily, limequats juice very easily so it was less painful than I anticipated. And here is where we reach the catch. 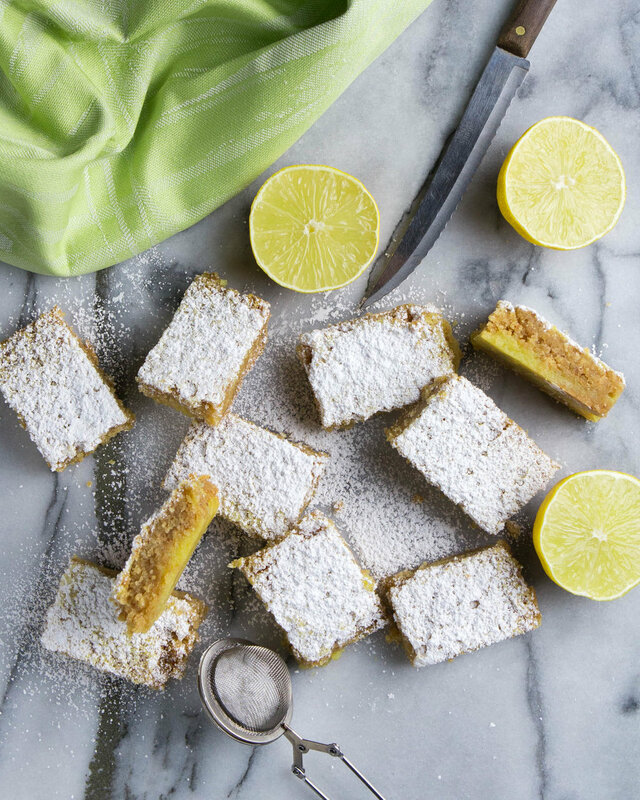 In a lemon square/bar, the shortcrust is denser than a graham cracker-type crust. And in a key lime pie, the filling is more viscous due to the condensed milk. So when you combine a porous graham cracker crust with a liquidy filling, the filling seeps through. Much to my initial dismay, I was crushed. I had achieved the soggiest bottom of all crust bottoms. As I started eating away my disappointment by cutting tiny bits from the edges, I noticed that the curd filling I was looking for was not completely gone but was in fact at the bottom of the bars. And the crust that I thought was going to be a sopping, soggy mess had more of a cake-like texture. So perhaps it wasn't a complete kitchen mishap but rather something new I had discovered. With a healthy dose of powdered sugar to hide the rather crater-like top, they looked relatively normal. On Instagram Stories, I asked if anyone wanted the recipe or if I should keep developing. Seeing as I have nothing to lose by posting it, here it is in all of its glory. I hope to work on the actual Lime Bars I was originally envisioning. But for now, there are these. Here's to recipe development and trying new things! Preheat oven to 350ºF. Line a 9"x9" or similar sized baking pan with aluminum foil. Grease lightly. Set aside. Pulse crackers in a food processor or place crackers in a Ziploc bag and crush them with a flat surface. They should be the texture of fine bread crumbs. Stir in granulated sugar, melted butter and salt until combined. Texture should now resemble course sand. Dump crumbs into the lined baking pan. Press in an even layer on the bottom of the baking sheet with the back of a spoon. Bake for 20 minutes. Once the crust has finished baking, pour the filling on top and bake for another 20 minutes or until the top springs back to the touch. Cool the bars completely, remove from the pan using the foil as handles. Cut into desired shapes and dust with powdered sugar.